The automotive industry faces a once-in-a lifetime transition and ACE EV Group is the flag bearer of a new innovative future in Australia. In 2019, we are launching a unique range of electric cars and light commercial vehicles, The ACE Cargo, ACE Yewt and ACE Urban. Advanced technology, zero emissions and local, specialised production. This is a new disruptive technology for the future of personal transport in Australia. The world is shifting to electric vehicles. Internationally governments are supporting uptake with measures such as Electric Vehicle targets, bans on internal combustion sales, road access restrictions (congestion / low-emission zones), purchasing grants and registration / tax discounts. People want them, most governments want them and businesses want them. The shift is undeniable and accelerating rapidly. The rise of the electric vehicle market over the past decade has been extraordinary. In what seems like a blink of the eye, auto manufacturers have gone from barely registering the possibilities of EV technology to embracing it. Now every major manufacturer has an EV strategy and the future of the industry looks bright for battery powered. To reserve an ACE Cargo, ACE Yewt or ACE Urban electric vehicle click here or for all other enquires please click here. 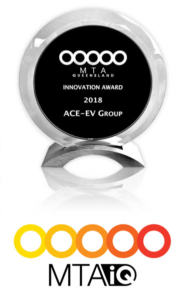 ACE EV Group has recently won an Innovation Award from The Motor Trades Association of Queensland (MTA Queensland). We are setting up manufacturing facilities in Australia and are now taking orders for 2019 for all 3 models.